Low-cost, high-quality textbooks are in! 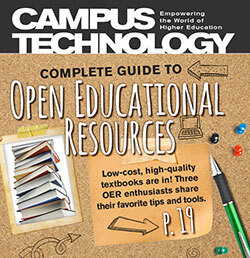 Three OER enthusiasts share their favorite tips and tools. The University of Alaska Anchorage aims to roll out campuswide e-portfolios by 2015. Two small colleges' joint IT projects are improving student services and saving on costs. Marrying data, predictions and business rules leads to student and campus success. These 10 strategies can help keep learners on track to successfully finish your online course. Marist College's The FOLD combines a Web site, MOOC and open online community. PAR develops predictive analytics for student success and links interventions to risk factors. Kennesaw State U is giving MOOC students a clear pathway to a degree.